Forget what you know or think you know about negative entities. Unless you are one of the few who have encountered a demon, it’s almost impossible to grasp the depth and scope of such pure evil and how these creatures can enter someone’s life and completely turn it upside down. 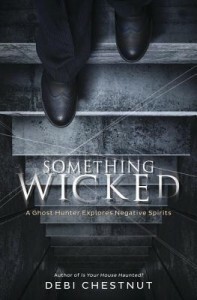 Something Wicked explores the topic of negative energies, dark forces, and exorcisms with fresh eyes so that you may come to your own conclusions. I read a few books by Debi Chestnut already, and usually I find them quite enjoyable. However, Something Wicked missed the ball for me. I didn’t enjoy the book at all. From the synopsis, I thought the author would give an explanation about negative entities, more in particular demons, and then would go on to detail some cases she worked on. While the author does mention some cases, it’s rather vague, and doesn’t give out a lot of details, making it rather boring. I understand the need to protect the people involved, but still, if you don’t give out any details whatsoever and just a basic rundown, then it makes for rather boring reading. Also, the book was very, very repetitive. It paraphrased sections from what the Vatican said about demonic possession, for example, and then underneath, explained the already paraphrased sections again. It just felt as if someone without any experience could’ve written the same book. It all stayed very much on the surface, rephrasing knowledge already known to most people with an inkling of interest in the paranormal world. The writing was dull, and it’s more than a manual than anything – except not a very enjoyable manual to read. I have to say it was a dissapointment, and I expected more. I read it to the end because I forced myself to, but I didn’t enjoy it at all, in fact, I was bored ofr most of it. I would muh rather recommend “Stalking Shadows” or another book by this author.